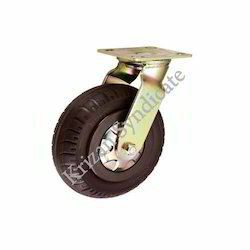 At Krizan Syndicate we are engaged in bringing to the clients the excellent range of Pneumatic/Semi-Pneumatic Caster Wheels. These ranges encompass the durability and sturdiness quotient with their high quality material like cushioned rubber and/or extra thick solid soft rubber with smooth shock absorption technique. These Semi Pneumatic Caster Wheels are the deluxe models. You can use them for even heavy duty service. 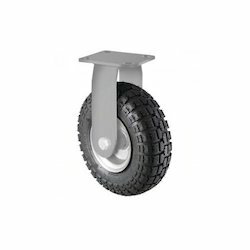 They will handle any job that is practical to mount on their pneumatic wheels with ease. This Pneumatic Caster Wheel series is combined with heavy-duty forged steel and also is enhanced with a bright zinc plate finish to prevent rust and wear in indoor and outdoor applications. It also has sealed precision tapered roller bearings for easy mobility. Looking for Pneumatic Caster Wheels ?